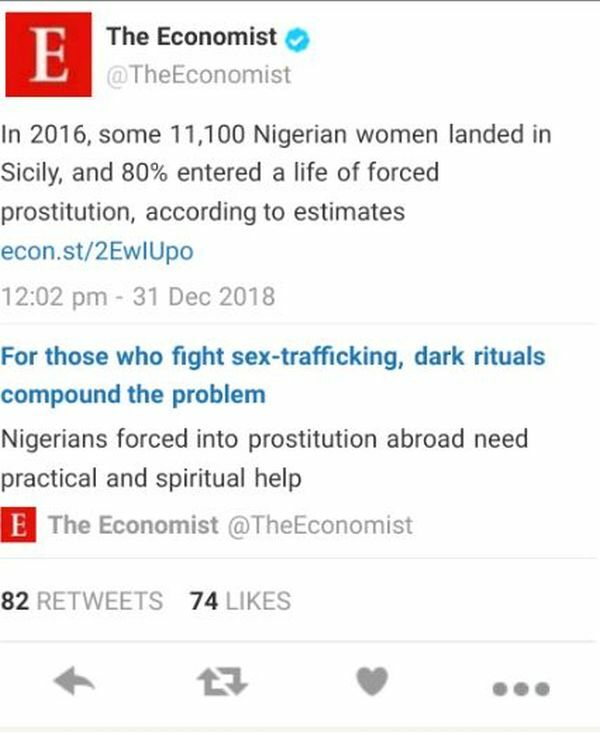 The Economist magazine is reporting on Twitter that over 11,000 women from Nigeria landed in Sicily in 2016 alone and most of that number are into involuntary flesh trade. One of the most notorious North-South rackets involves transporting young women, often minors, for s*x work in Italy and beyond from Nigeria, in particular the southern area around Benin City. That part of the country has a powerful Christian presence, from Catholic to Pentecostal, but it is also a stronghold of traditional animist practices, including witchcraft. Its s*x-slave trade has existed for three decades but it seems to have burgeoned recently. The International Organisation for Migration estimatesthat in 2016, some 11,100 Nigerian women landed in Sicily, and 80% entered a life of forced prostitution. Coerced by friends and Family to sort better life abroad, most of the victims are preteen girls of 14 , 13 and 20 sold false situation of jobs they would be doing, and forced to swear to secrecy via diabolic means. This troubling stat was part of the Magazine’s recent publication on forced labour and chuman trafficking.